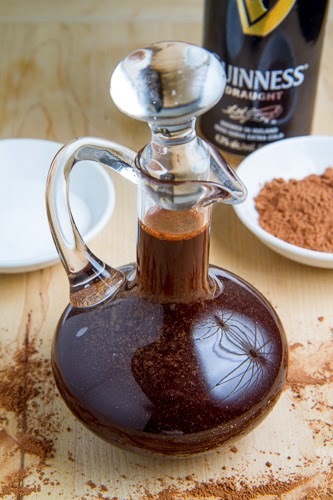 Homemade chocolate syrup made with Guinness which brings out and enhances the chocolaty flavour of the syrup! seriously need to, you will know that Guinness brings out chocolates natural flavour, enhancing it, making it even better. For my next St Patrick’s Day dish I needed a chocolate syrup and in my mind a Guinness chocolate syrup was the only way to go! A simple syrup, just like its name implies, is really simple requiring just water and sugar to be combined and simmered to melt the sugar and thicken the syrup a bit. 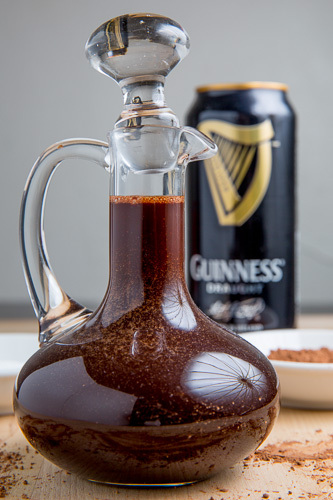 A chocolate syrup is made by adding cocoa powder to the mix and a Guinness chocolate syrup is of course made by simply replacing the water with Guinness. 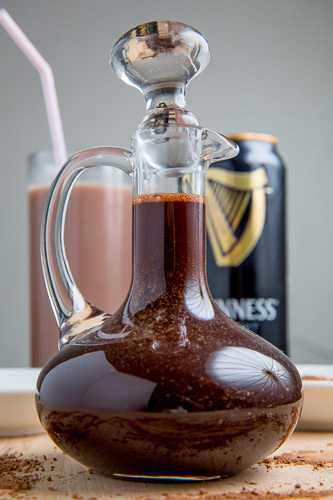 As easy as this Guinness chocolate syrup it is also amazingly good and I cannot wait to start using it! Would anyone like a glass of Guinness chocolate milk? Bring everything to a boil, reduce the heat and simmer to thicken, about 5 minutes. This looks amazing and so simple! I wonder if you could use it in a cocktail? Pretty sure my husband would think he'd died and gone to heaven if I made this for him. YUM! I knew it, your on a mission. Your goal is to destroy the diets of the world!!!! You thumb your nose at our desire to be skinny with these mouth watering temptations of chocolate glory. Could this be made with brown sugar? Anonymous: Yes, this can be made with brown sugar! I was thinking of making this for a gift, what would the shelf life be? Thank you! Anonymous: This will keep for a long time, months, in the fridge. Enjoy! Guiness chocolate milk… is this possible??? That sparked all kinds of taste buds but would it really taste good? I just got done making this, using brown sugar…OH…MA…GERD! Effin' amazing! this is super easy to make a super rich, chocolately syrup. it tastes much better than store-bought syrups. i used it on the chocolate guinness pancakes and in chocolate milk. it also dissolves into cold milk much more easily than store-bought syrup. this is my go-to for chocolate milk from now on. btw, the flavor is strong, so careful not to use too much!